A review of the card game Bad Neighbors. A fun filler game for 2-5 players, you must defend your home from monstrous attacks played by your neighbors. As part of being a society, most of us have to live in close proximity to one another. Many people are lucky enough to have great neighbors living next door to them. However we aren’t all that lucky. That’s where Bad Neighbors comes in. Bad Neighbors answers the age old question: What if I could send some zombies or aliens to take care of those annoying neighbors. Come on, you have all thought about sending a vampire to take out that pesky neighbor with the loud stereo. Admit it. Well it’s time to live out those fantasies in the new card game: Bad Neighbors. Does Bad Neighbors have what it takes to live peacefully on your gaming table or does it need to be eaten by a face humper? Read on to find out! 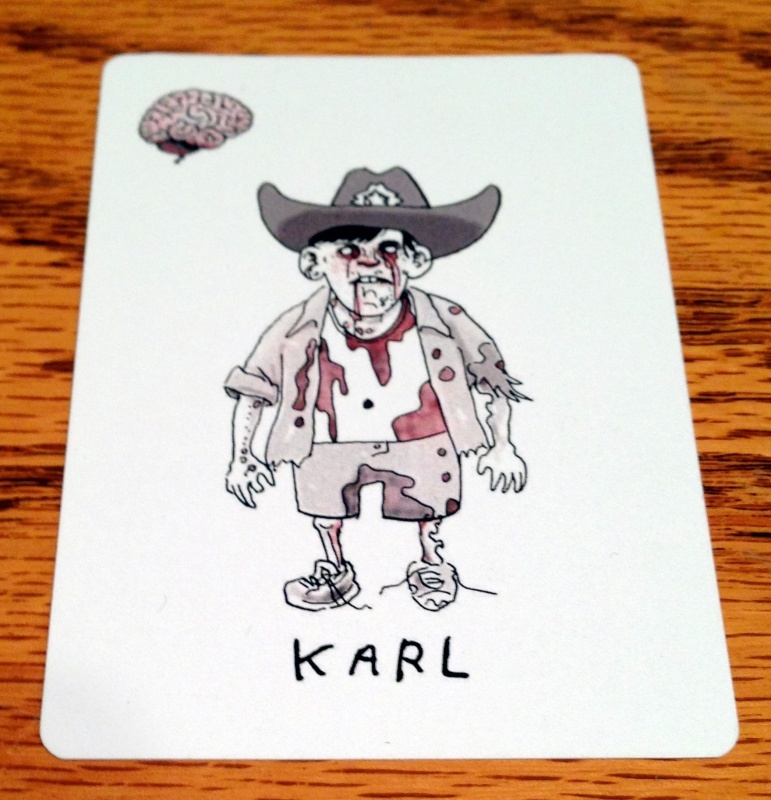 Bad Neighbors is a card game for 2-5 players developed by indie publisher Cuddle Manor. Bad Neighbors plays in about 15-20 minutes and is best with 3-4 players. The game play in Bad Neighbors is fairly simple. Play cards, attack, defend and draw. 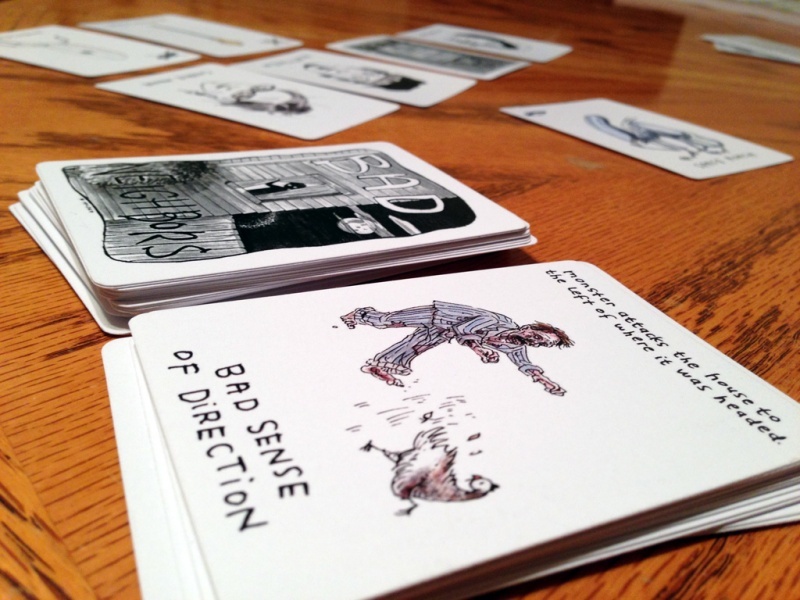 Bad Neighbors is a card game developed by the new publisher: Cuddle Manor. In this game you are trying to kill off your neighbors while also keeping your family alive. On a turn you can either attack another player or play an action card. When attacked yourself, you can equip a defense card to stop the attack and prevent future ones. Fail to defend and a family member dies. When all 4 die it’s game over for you. Be the first to fully equip your family or be the last alive and you win. As with most card games, there are not a lot of components in the game. Bad Neighbors comes with about 70 different cards divided among the play cards, family cards and rules. The cards are easy to read and feel fairly sturdy. The artwork on the cards is fairly unique. To be honest, I wasn’t sure I liked the art at first. But after seeing the full range of it and playing the game, I actually ended up enjoying it. I feel that it fits well with the game and the game’s theme. It has a light and comedic feel to it which works well with the overall tone of the game. A players hand will consist of action cards, attack cards and defense cards. Game play in Bad Neighbors is easy to learn. Each player starts the game with 4 cards representing their family and 4 cards from the draw deck in their hand. 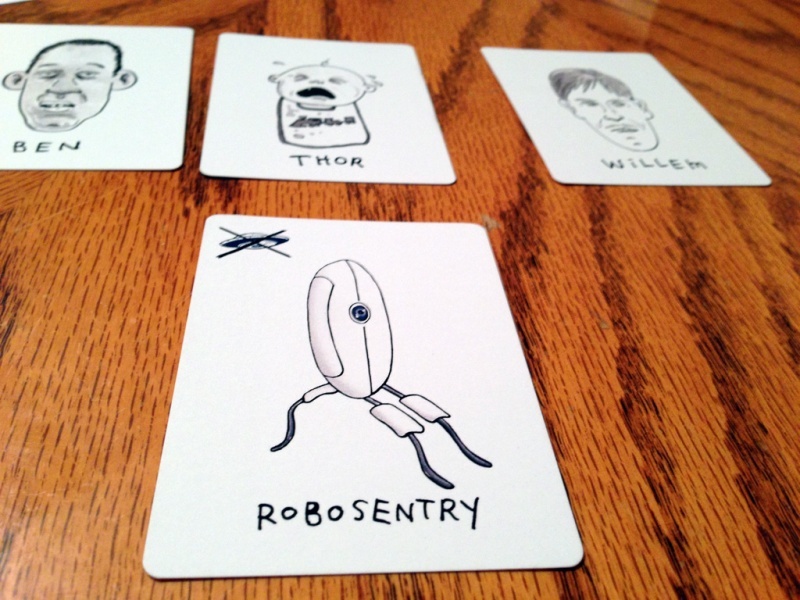 Each turn a player must either play a card or discard a card. To play a card it either has to be an attack or an action card. Attack cards are monsters that are sent over to another neighbors house. They will be one of 4 categories: Zombies, Vampires, Aliens and Demons. The defending player can either play a matching category of weapon to defeat the monster or give up one of his family members to be eaten by the monster. Action cards are one time use cards that do special things like steal a family member, add a new family member, kill off an opponents character or prevent a fatality. If you can’t play either of those types of cards then you simply discard 1 card and draw back up to 4 cards. The next player then takes his turn and play continues until either one person has fully equipped their family or is the last one alive. Bad Neighbors is fun, easy to learn and humorous. No gamer should be without these quick and easy filler games. Bad Neighbors isn’t a serious game. If you are looking for a deep strategy game with calculated moves, you’ll be very disappointed. However, as a filler card game, it works really well. 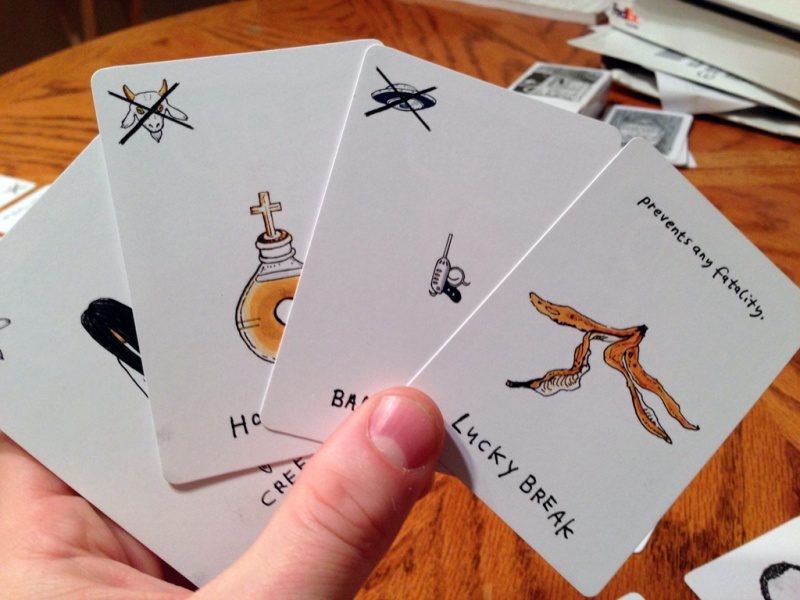 With Bad Neighbor’s theme and artwork, you need to be ready to have fun and enjoy the comedic value of the cards. You will be sending your Face Humper to kill a neighbor, but once it gets there, that monster might be killed by a well played Robo Sentry. A lot of the monsters and items have been inspired from TV and Movies. This as a nice pop culture twist to the game. The monsters parody pop-horror icons form TV and movies. Aliens, The Walking Dead, Buffy, and others will be recognizable here. And that’s part of what give Bad Neighbors its charm. I feel that the TV/movie references help to add to the enjoyment of the game. Cuddle Manor did a great job of making the characters and items recognizable, but still giving them their own humorous twist. 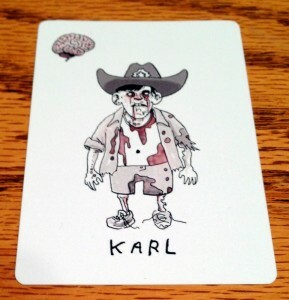 I particularly enjoyed the Karl card, a clear Walking Dead reference. Another nice thing about Bad Neighbors is its simplicity. The rules only take about 5 minutes to explain and are very straightforward. This is a game that can easily be brought out to kill some time without a great deal of investment. Since you can play a game in under 20 minutes, it’s a great game to play while waiting for people to show up. 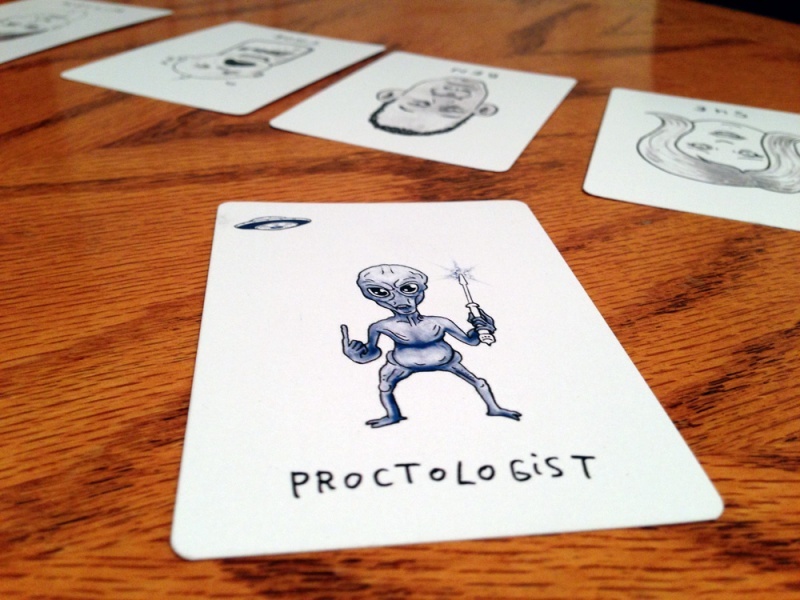 Given its portable and humorous nature, it also makes a good bar game to play while you’re having a few beers. While the game is a lot of fun to play, we did find a couple of flaws in our game sessions. First, if you are playing a 5 player game, it’s entirely possible that someone will be eliminated before they even get a turn. Since you don’t draw until your turn, if a player finds out that you are lacking a defense card, it will be easy for the other players to attack you with the same monster type knowing you won’t be able to defend. Frustrating, but fortunately it didn’t happen too often. Players did get attacked multiple times before they got to draw again, which resulted in a lot of unstoppable carnage. The other issue we ran into was near the end of the game. There were only two players left, each of which was missing 1 defense item. Both players had the item, but couldn’t play it until they were attacked by the appropriate monster. Both players figured that out so neither of them would attack with the right monster. This led to a stalemate until someone drew an action card that let them immediately kill the last family member. This only happened once, so it’s probably somewhat rare, but it is something to be aware of. Over all though, we had a great time with Bad Neighbors. We found it to be a humorous and enjoyable filler game. It’s a fantastic game to open a longer game night (or close one out) and fits in really well in the “filler game” category. Something no gamer should be lacking. Defend your family at all costs. When they die, you lose. While Bad Neighbors won’t be winning any awards for its deep game play, we found it to be a fun and enjoyable filler game. The theme was definitely a unique one and Cuddle Manor did a great job creating the game. The few flaws we found were relatively minor and didn’t diminish our enjoyment of the game. Every gamer should have a deep collection of filler games as playing any one too much will get stale quickly. With a quick play time and easy to learn rules, we were able to get in 3 games at the end of our game night, which is a good quality for a filler game to have. Bad Neighbors makes a great addition to the genre and fits right in line with other games of this type. It’s worth picking up if you are looking for a new and unique card game from a up and coming indie publisher. Final Score: 2.5 Stars – Fun any easy to learn, it makes a really good filler game. Not an every day play, but will work its way into the rotation.